A good way to generate an income on a portfolio with existing shares is to sell a call option on them. The average income on call options range from 1.5% to 2% monthly. The easiest stocks to trade call options on are US stocks therefore what I discuss below is based on US stock options. There are a few things you should know before you start trading call options. You are not automatically able to sell call options you must contact your broker and discuss how to get access to selling call options. This can be an easy process varies from broker to broker. LEARN THE BASICS OF CALL OPTIONS. A call option is a contract that has the right but not the obligation to buy a stock. When you sell a call option you give someone the right to buy your stock. You choose the price that you want to sell your stock i.e. the strike price and the buyer agrees. The buyer has the right, until expiration, to exercise that call option. The object of the market is to buy low and sell high thus if the stock price is below the agreed strike price then the buyer will not exercise the call option. 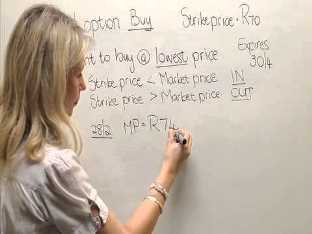 If the stock price is above the agreed strike price then the buyer will exercise the stock option and buy your stock at the agreed strike price. Call Options only trade in 100 round lots of stock so you can only sell call options on stock that you own more than 100 shares of. I would recommend that you attempt this on a paper trading account before attempting it on your real account. Start learning how to trade call options today to generate additional income in your portfolio. If you want to learn more about generating an income by trading call options attend one of ourtrading seminars.